NetworkNewsWire Editorial Coverage: Amazon’s food and beverage category has posted $4.75 billion in sales thus far in 2018 and is the online retailer’s fastest growing segment. Amazon’s food and beverage category is the online retailer’s fastest growing segment. Coffee is the most popular subset of the company’s category. Youngevity International is one of the savvy companies seizing the opportunity to establish itself as a leader in the space. A growing number of companies are working to stake their claim in the online giant’s coffee marketplace, for good reason: coffee is the most popular subset of Amazon’s food and beverage category. Youngevity International, Inc. (NASDAQ: YGYI) (YGYI Profile), a leading omni-direct lifestyle company with emerging holdings in the coffee industry, announced recently that it would be getting in on the action with its wholly owned coffee manufacturing subsidiary, CLR Roasters. Starbucks Corp. (NASDAQ: SBUX), Keurig Dr. Pepper, Inc. (NYSE: KDP), and Nestle (OTC: NSRGY) were the top three sellers of coffee on Amazon in 2018, with year-to-date sales totaling more than $16.8 million, $12.6 million, and $11.2 million, respectively. The J.M. Smucker Company (NYSE: SJM) has also been focusing on increasing its presence in the premium and single-serve coffee space. The price of coffee futures overall has been steadily on the rise over the last few years, and Amazon has taken advantage of the promising trend. Analysts predict that the company’s share of the online U.S. food and beverage market will reach 31.8 percent in 2018. And the news gets better for the innovative organization: online grocery sales are expected to reach $100 billion by 2025, with Amazon’s market share of the industry only expected to grow. Coffee sales will be a significant part of that growth. According to Edge Market Share, coffee sales on Amazon have totaled more than $140 million so far this year, and with the trend consistently moving up, the numbers for companies selling on the site are likely to increase as well. Youngevity International, Inc. (NASDAQ: YGYI) is one of the savvy companies seizing the opportunity to establish itself as a leader in this growth. 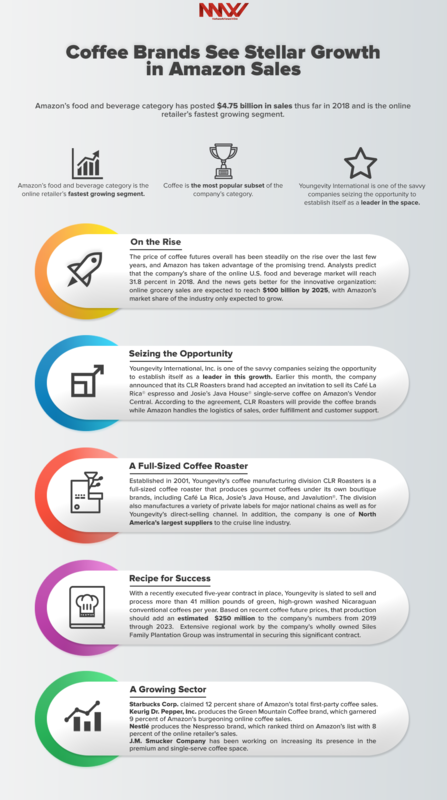 Earlier this month, the company announced that its CLR Roasters brand had accepted an invitation to sell its Café La Rica® espresso and Josie’s Java House® single-serve coffee on Amazon’s Vendor Central. According to the agreement, CLR Roasters will provide the coffee brands while Amazon handles the logistics of sales, order fulfillment and customer support. Established in 2001, Youngevity’s coffee manufacturing division CLR Roasters is a full-sized coffee roaster that produces gourmet coffees under its own boutique brands, including Café La Rica, Josie’s Java House, and Javalution®. The division also manufactures a variety of private labels for major national chains as well as for Youngevity’s direct-selling channel. In addition, the company is one of North America’s largest suppliers to the cruise line industry. CLR has been a pioneer in coffee innovation, being the first entrant into the fortified coffee niche with its Youngevity JavaFit® brand. And in May 2014, CLR acquired a coffee plantation and processing facility in Nicaragua, allowing the entity to control coffee production and quality — from field to cup. With a recently executed five-year contract in place, Youngevity is slated to sell and process more than 41 million pounds of green, high-grown washed Nicaraguan conventional coffees per year. Based on recent coffee future prices, that production should add an estimated $250 million to the company’s numbers from 2019 through 2023. Extensive regional work by the company’s wholly owned Siles Family Plantation Group was instrumental in securing this significant contract, and Youngevity’s partnership with Alain Hernandez of H&H Export Group bodes well for the company’s further expansion in Nicaragua. CLR Roasters’ roasting operation roasts around 25,000 to 28,000 pounds per day, totaling 10 million pounds per year, with an annual grinding capacity of approximately 15 million pounds. The company’s field-to-cup strategy provides control over the process every step of the way, allowing Youngevity to consistently meet the industry’s high standards. This same strategy means that CLR Roasters can work directly with its customers to develop unique, customized blends. The company offers its customers a variety of packaging options to meet every consumer’s needs. From two-ounce fractional packs and five-pound bags to single-serve K-Cups of customized blends — which it can produce at the rate of 220 per minute — the company’s production facility provides both versatility and speed. And in addition to the impressive operational scale of its facility, CLR Roasters prides itself on the retention of boutique roasting methodologies, including visual, touch and smell-based analysis by in-house roasting veterans. Amazon’s grocery sector in many ways remains the Wild West of online retail, with near-unlimited potential and opportunity for growth. Edge Market Share reported that in 2017 Amazon owned an 18 percent share of the U.S. online grocery market. In 2018, that number has already jumped by more than 30 percent, with a particular focus on the online coffee space. Youngevity isn’t the only company eyeing the promising potential online coffee sales provides. Starbucks Corp. (NASDAQ: SBUX) claimed 12 percent share of Amazon’s total first-party coffee sales. The company’s sales for key coffee items nearly tripled in size since last year, putting it in the top spot in the category in 2018. A premier roaster and retailer of specialty coffee worldwide, Starbucks is also exploring other avenues of delivering its coffee to consumers. The company recently announced that by early next year, nearly a quarter of its more than 8,000 company-operated U.S. stories will offer Starbucks Delivers via Uber Eats. Earlier this year, Keurig Green Mountain and Dr. Pepper Snapple Group announced a merger, creating the seventh-largest company in the U.S. food and beverage section and the third-largest beverage company in North America. The resulting company, Keurig Dr. Pepper, Inc. (NYSE: KDP), produces the Green Mountain Coffee brand, which garnered 9 percent of Amazon’s burgeoning online coffee sales. In addition to online coffee sales, the company markets the top single-serve coffee brewing system in the country. Nestlé (OTC: NSRGY) produces the Nespresso brand, which ranked third on Amazon’s list with 8 percent of the online retailer’s sales. Nestlé works with more than 75,000 farmers in 12 countries through its AAA Sustainable Quality™ Program to embed sustainability practices on farms and the surrounding landscapes. Launched in 2003 in collaboration with The Rainforest Alliance, the program helps to improve the yield and quality of harvests, ensuring a sustainable supply of high-quality coffee and improving livelihoods of farmers and their communities. J.M. Smucker Company (NYSE: SJM) has been working on increasing its presence in the premium and single-serve coffee space. Earlier this year, the company unveiled one of its most significant coffee growth initiative to date: a new line of premium coffees designed to strengthen its position in the fastest growing market segments and serve as a broad platform for future growth and innovation. The new line, 1850, draws on the rich heritage of The Folger Coffee Company, which was founded during the 1850’s Gold Rush in California. The company hopes the line of coffee will appeal not only to traditional Folgers drinkers but to a younger generation of consumers that generally prefers richer coffee blends.